In my hunting for ritual traditions for this time of year I’ve come across the cruel deity Crom Cruach. He was a pre-Christian God of Fertillity in Ireland who was propitiated with human sacrifice. His cult idol image was a gold figure surrounded by twelve stone or bronze figures. The first born child would be sacrificed to this idol in exchange for a good yield of milk and grain. An early King, Tigernmas, along with three quarters of his army, is said to have died while worshipping Crom on Samhain eve, commonly held on the 31st October. Crom Cruach, the name possibly meaning “bloody crooked one”, “crooked stack of corn”, “crooked one of the mound”, or “bloody head”, was worshipped until St. Patrick destroyed his icon. According to medieval legend St. Patrick raised his crozier (the ornamental staff of high ranking catholics) and the central golden figure fell face down to the ground with the imprint of the crozier left on it. The other figures then sank into the earth. The demon that lived inside the image appeared but St. Patrick cursed him and cast him to hell. A bonfire ritual practiced in parts of Scotland and Wales this time of year may once have involved human sacrifice. The practice involves a bonfire with each participating person placing a stone in a circle around the bonfire. Everyone then runs around the bonfire with a torch shouting and exulting. In the morning the stones are checked, if any have been mislaid the person who set down that stone wont see out the year. So the next taster from my selection of exhibits for the 7th Nov is Bitten By A Monkey. Now this group you really have to hear live, the recorded stuff is nothing compared to the real weird excitement of the live act. The last time I saw them they didn’t have a keyboard which was a real shame, although coped with handsomely. I missed the keyboard so when I found Downstairs at The Vortex has two pianos (one very out of tune!) I just had to ask Bitten By A Monkey to play. 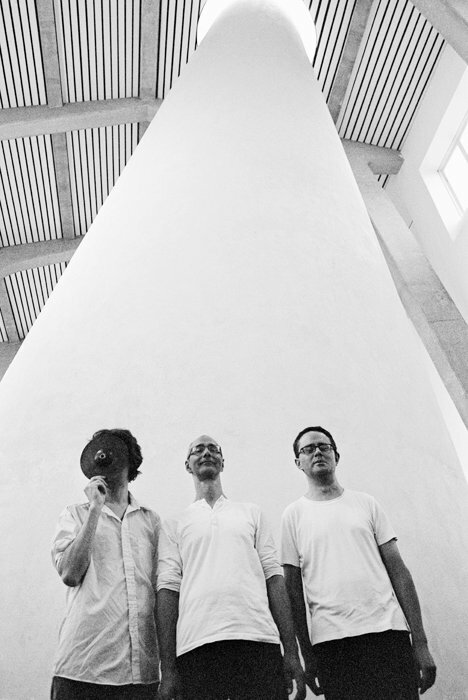 Steve Myers and brothers Roland & Dylan Bates have been playing, composing, and philosophising together regularly for sometime, all exceedingly talented muscicians they describe themselves as alternative/experimental/folk. One of my favourite pieces of theirs is The Quest for Authorization, each time I’ve heard it performed its been completely different and each time its been disturbing and pleasurable in equal measure, genius. Something other is the best way I can describe it. Dylan Bates: violin, saw, mediaeval fiddle, overtone flute, xaphoon. By all means listen to the myspace link, but remember the live act is something else, something wondrous, something magic! The Library is putting on an event! Storytelling, music, poetry, film. Its called Mr Slaptail’s Curious Contraption (after a children’s book about a group of river animals that build a scientific contraption). The Librarian will be there collecting ghost stories, the Rude Mechanicals will be conjuring up monsters, Bitten by a Monkey will be chanting disturbing monk-like improvisations, Bird Radio shall be the modern day one man band he is, and Miss Roberts shall be loving and abusing musicians and audience alike. 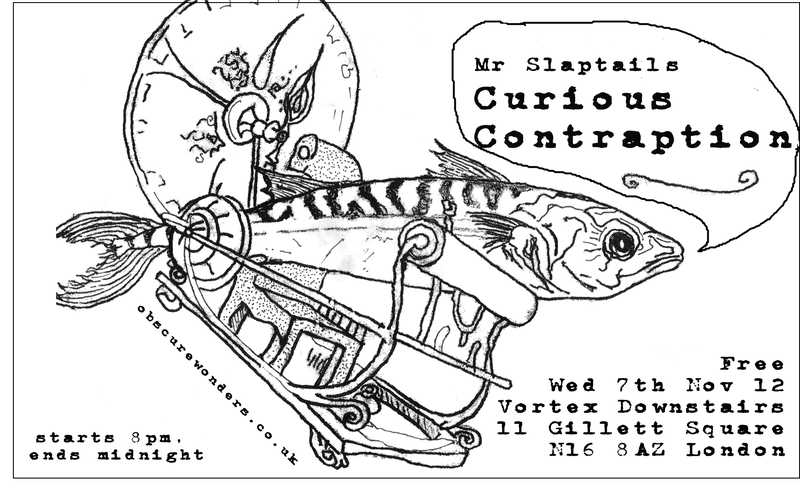 It will be held on 7th Nov at the Vortex Downstairs, Gillet SquareLondon. Thought I’d show a taster of some of the exhibits on here. First the beautiful films of Chiara Ambrosio. 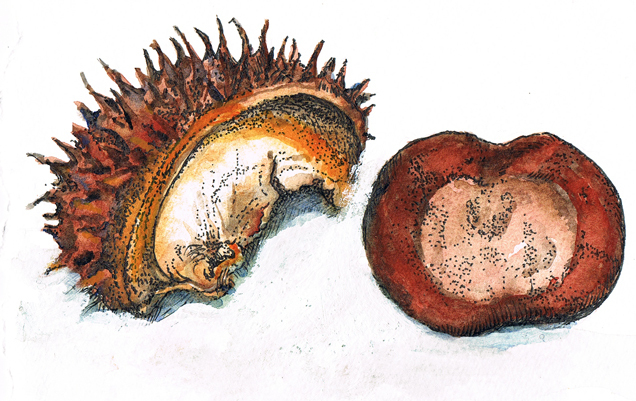 Half an onion was discovered at the very back of the kitchen cupboard amongst a quantity of crumbs of indeterminate origin and a dried up carrot. It’s outer skin has started to rot, but from its centre emerges a large white horn, bareing a striking resembalance to what may be described as a minature Rhino’s horn, only far whiter. I took it out of the cupboard and placed it on the window sill. The horn has grown so quickly it is four times larger now than it was when I found it (in fact it grew from 3.3cm to 14.1cm approx), and it’s tip has turned green. I did think that I should sit down in front of it and watch it for a whole day, but grew bored with that and gave up. Instead I looked up some health facts about onions on the internet (I’m feeling rather cold ridden today). ‘They appear to be at least somewhat effective against colds, heart disease, diabetes, and other diseases and contain antiinflammatory, anticholesterol, and anticancer components. It has now started growing another horn like shoot, plus the first horn has developed two offshoots. I’ve given it a bit of water, though not being watered at all didn’t seem to bother it. I guess it gets nourishment from what remains of the onion. I decided to paint a picture of it. 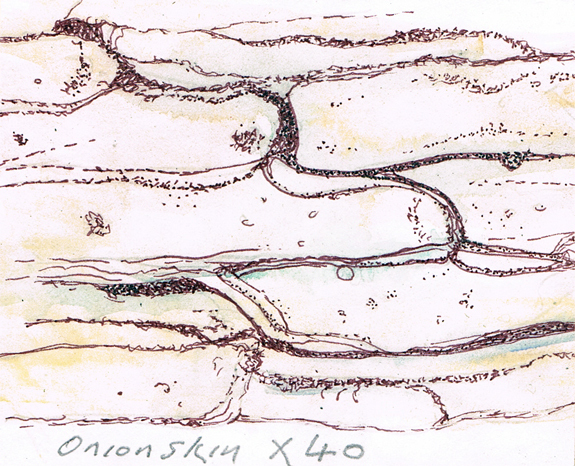 Watercolour and pen sketch of the onion sitting on the kitchen window sill. Although the abandoned state seen above is clearly aesthetically pleasing (the curved onion base tilting slightly forwards to balance the horn, giving a sense of strain and desperation that can only be felt by the liberated onlooker) I’ve decided to plant the onion in a small brown ceramic bowl with a little mud. 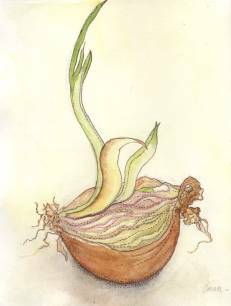 I felt that in order to fully explore the onion growing process I needed to encourage growth and that the best way to do this might be to plant it. The onion has continued to grow, I give it a single drop of water every day. I have decided to explore the biological constituency of the onion further. 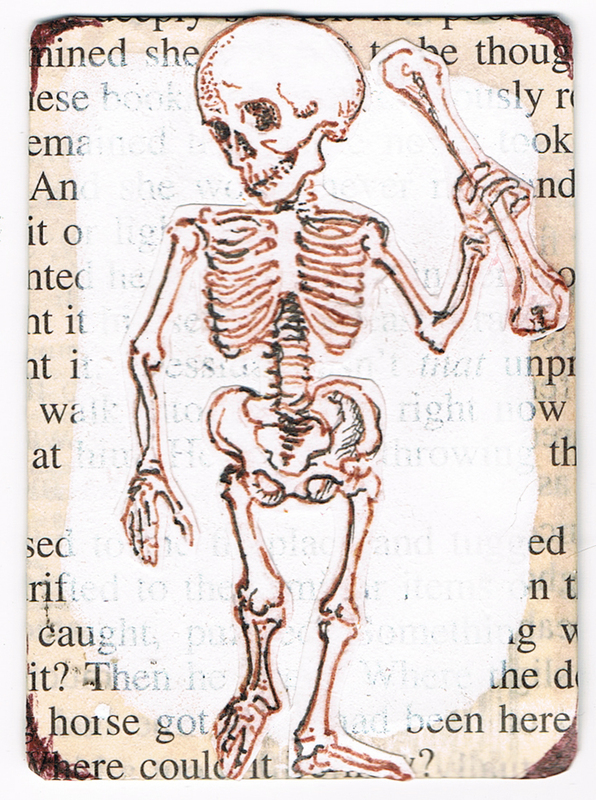 I dig part of it up and peel off a tiny bit of inner skin. From this I peel off a transparent film which I put on a slide and dye with a drop of iodine, I then put the slide under the microscope. This activity is one of the first uses of an optical microscope that most students encounter in a biology lab. Onions are used because they have large cells that are easily visible under a microscope and the preparation of a thin section is very straight forward..An onion is made of many concentric layers. 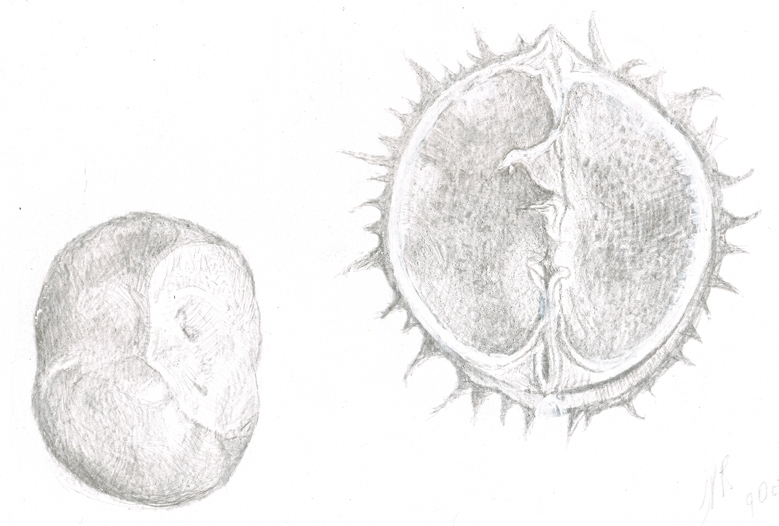 Each layer is separated by a thin skin or membrane. The half an onion grew rapidly for a bit but now appears to be dying. I did it up out of its ceramic bowl and place it on the window sill. It has a different type of beauty now, full of rich purples, deep reds, and the withering of its stems has a dramatic appeal. Evidence, 12ft by 8ft Oil painting on Canvas. 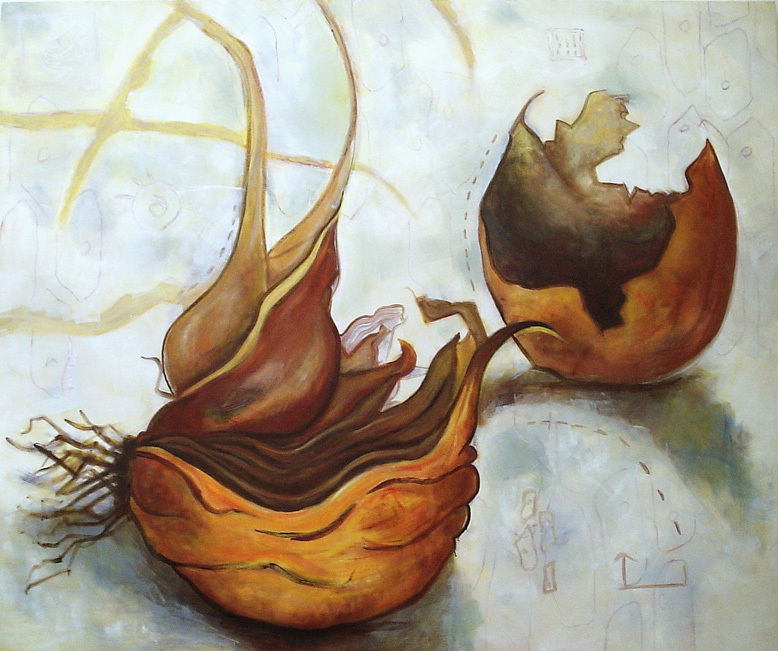 This very large painting was done from a sketch of the dying onion. I won Challenge the Nail art prize that year and had my first solo London show. I painted this picture for that. Why so large I don’t know, perhaps I was paying my respects to the onion somehow, or appeasing the god of onions.